Pope Francis is playing with fire. It seems that the converging crises engulfing the Catholic Church and the need to cultivate a supportive global constituency based on the Third World may have pushed the Pope to both ignore the free-market basis of functioning economic systems and desert the fundamental principles of Christianity. Caught in a perfect storm of scandal and relevance, Francis appears prepared to capitulate to the neo-Marxist paganism that underlies the Deep Green ideology of the global environmental movement and assume a vanguard role in constructing a global welfare state, established to mitigate the alleged effects of climate change. This capitulation has two dimensions: economic and theological, as will be discussed below. The Pope’s encyclical Laudato si’ (‘Praise Be to You’) on the environment has already attracted massive attention, and has been deliriously applauded by radical environmentalists, political radicals, moral utopians, failed states, kleptocracies, NGOs, and the innumerable other rent-seeking organizations and elites that stand to benefit if they are successful in imprisoning the productive forces of the world within a global straightjacket controlled by them. Pope Francis has a grand mission here on Earth, and he gives no quarter … he is a revolutionary. Pope Francis’s call-to-arms will be broadcast loud, clear and worldwide. Not just to 1.2 billion Catholics, but heard by seven billion humans all across the planet. The fact is the pontiff is already building an army of billions, in the same spirit as Gandhi, King and Marx. These are revolutionary times. Deny it all you want, but the global zeitgeist has thrust the pope in front of a global movement, focusing, inspiring, leading billions. Future historians will call Pope Francis the “Great 21st Century Revolutionary”. Watch the ripple effect … after Pope Francis addresses the UN General Assembly [and] how the revolution picks up steam after the UN’s Paris Climate Change Conference announces a new international treaty approved by the leaders of America, China and two hundred nations worldwide. Tragically, at an economic level, the encyclical has little to offer the global masses. It is economically illiterate, perpetuating the myth that poverty can be overcome through moral exhortation, central control and income redistribution, rather than the promotion of free enterprise and individual effort. It also promotes a cargo cult mentality, according to which the ‘rich North’ of the global economy owes an ‘ecological debt’ to the supplicant nations of the ‘poor South’, as if this will be rectified by the gargantuan transfer of wealth from the tax-paying middle classes of advanced societies to the various corrupt and incompetent regimes that control these ‘victim’ countries. It is hard to credit that Francis, or any person of intelligence and a presumed advanced awareness of the human capacity for wickedness, could imagine that a trillion dollar global fund could or should be created by pillaging the Western middle classes and then funnelling that swag to the masses in Botswana, Bolivia, Swaziland, South Africa, the Philippines and innumerable other supplicant nations without seeing corruption, incompetence, and maladministration on an utterly unprecedented scale. In fact, economically the encyclical is merely a re-hash of the familiar Marxist-Leninist diatribes against Western imperialism that have been the lingua franca of the international Left for 150 years. Consequently, in its hysterical utopianism it invokes the same totalitarian ideology that provided a rationale for the catastrophic forms of centralized state economic planning that crippled the economies, devastated the environment, and systematically enslaved and killed scores of millions of people in the Soviet Union, Communist China, Cambodia, and other communist states. Operating under the thrall of Marxism-Leninism, an earlier generation of economically illiterate ideologues attempted to run the economies of those benighted states (intended to be utopias of peace and social justice) via bureaucratic diktat and brought only carnage and disaster. Disturbingly, it appears that the Pope’s encyclical proposes that this murderous and dictatorial approach be pursued on a global scale, using the notoriously corrupt United Nations as its vehicle or model. Such draconian action is justified, according to Pope Francis, because it is not communist or fascist (or Islamist) totalitarianism that has proven to be the problem of the modern world. Neither is it endemic corruption, or ethnic, tribal and religious hatreds, or theocratic Messianism and obscurantism that are stopping nations from achieving their potential. Rather, it is free market capitalism that is the “root cause” of all of the world’s problems. Capitalism, inter alia, involves immorality, social injustice, “the greedy exploitation of environmental resources, [the] monopolizing of lands, deforestation, the appropriation of water … climate change, the loss of biodiversity and deforestation [and other] devastating effects in the great cataclysms we witness.” What the latter are is left quite imprecise, but there is no recognition of the great human cataclysms wrought by totalitarian regimes based on the central planning of bureaucracies pursuing utopian fantasies. 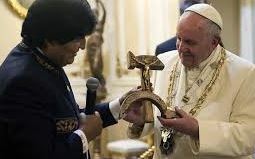 In this context, the Pope’s recent acceptance (right) from the socialist president of Bolivia of a crucifix in the form of the crucified Christ nailed to a hammer and sickle is truly disturbing. Conflating Christ with the dread symbol of Marxist-Leninist oppression is not only an insult to Christians and the victims of Stalin’s purges it also promotes the notion that Christianity and communism somehow share the same ethical values — a falsehood providing the rationale for the same neo-Marxist Liberation Theology that Francis once opposed but now seems desperately anxious to embrace, as I discussed in an earlier Quadrant article. It is no longer man who commands, but money. Cash commands. Greed is the motivation … An economic system centred on the god of money needs to plunder nature to sustain the frenetic rhythm of consumption that is inherent to it. Consequently, Francis calls for a “radical new financial and economic system to avoid human inequality and ecological devastation.” It appears that Francis has not bothered to look across the Adriatic at Greece to see how quickly a society and its economy disintegrate without properly functioning monetary and financial systems. Indeed, Greece is the perfect example of what happens when gigantic and centralized political and economic organizations pursue grand aims that entrap entire nations in their plans. Its fate also exemplifies the consequences for those countries of pretending that economic laws don’t exist. Francis made his radical ideological and political commitments crystal clear by embracing the views of anti-capitalist and Deep Green ideologue Naomi Klein. Indeed, it’s been observed that in Laudato si’ and his public statements Francis “sounded like Naomi Klein in a cassock“. Klein is a self-defined “secular Jewish feminist” who appears to fancy herself as a modern day Rosa Luxemburg, dedicated to leading the people into the golden age of communism. She has recently published a widely promoted polemical tome, immodestly titled This Changes Everything: Capitalism vs. The Climate, in which she advocates “managed de-growth” on a global scale, ostensibly to combat climate change. In fact, Klein has made it clear that she joined the climate change crusade as a means to the end of mobilizing the global masses in a rebellion against capitalism. This followed a conversion experience in Geneva that she describes in This Changes Everything. There, a Bolivian economist explained how climate change panic meant his nation could now portray itself as ‘climate creditor’, morally empowered to demand money, technology and aid from the richer ‘climate debtor’ nations of the West. Suddenly, Klein realized how the threat of climate change could be used to realign contemporary politics and serve as the basis of a populist campaign to reverse the neoliberalism that had reigned supreme since Thatcher and Reagan. In effect, climate change was to become the Trojan Horse through which the policies of deregulation, free trade, privatization, fiscal austerity, tax reductions, plus individual responsibility and a reduced public sector could be subverted and reversed, and a global welfare state established, financed by the Western middle classes. It means policies that directly regulate how much carbon can be extracted from the earth. It means policies that will get us to 100 per cent renewable energy in two or three decades – not by the end of the century. And it means allocating common, shared resources – like the atmosphere – on the basis of justice and equity. “Justice and equity” (and access to the atmosphere), as defined by Klein and her supporters! The stakes are so high, time is so short and the task is so large that we cannot afford to allow those differences to divide us. When 400,000 people marched for climate justice in New York last September, the slogan was ‘To change everything, we need everyone’. The costs of remaking the world in this fashion will be carefully calibrated to target the global middle classes, demanding “sacrifice from those of us who can most afford to make do with less”. And their sacrifice will be justified because Klein’s strategy for a global economic shutdown will “save countless lives and prevent so much suffering”. Unfortunately, at no point in her massive tome does Klein even come close to defining “anything like an alternative economic system” to make any of this work, as even a sympathetic reviewer laments. However, there is more to Klein than warmed-over Marxism-Leninism and reactionary welfare state policies, and it is here that Francis faces an unprecedented danger: theologically he appears to be capitulating to the neo-paganism of the environmental movement, the core of which is a radical devaluation of human life. You don’t get much more human-centred than the persistent Judeo-Christian interpretation that God created the entire world specifically to serve Adam’s every need. As for the idea that we are part of a family with all other living beings, with the earth as our life-giving mother, that too is familiar to eco-ears. But from the Church? Christianity’s basic problem (…) is its ingrained anthropocentrism … entirely focused on humankind and its needs and aspirations to the exclusion of all other species and priorities. It is the unconscious assumption that the earth exists for us and that its total meaning is derived from us. Casting aside any concern with ‘the pathos of the human’ as unworthy, these theologians advocate a shift in focus from humanity’s relationship with a transcendent God to an obsessive concern with the earth, conceived as a spiritual entity – a shift from anthropo-centrism to Gaia-centrism. The traditional Christian God is seen as the ultimate in patriarchal oppressiveness and rejected in favour of the nurturing, matriarchal Gaia. This is accompanied by a rejection of any particular interest in the traditional Christian concerns about sin, grace, redemption, or the soul, etc, in favour of agonizing about our relationship with the earth. The Gospel is re-interpreted to be Gaia-friendly and environmental issues are moved to centre-stage, with all social and political issues analysed in terms of humanity’s exploitative attitude towards the planet. We recognize that separating humanity from nature, from the whole of life, leads to humankind’s own destruction and to the death of nations. Only through a re-integration of humanity into the whole of nature can our people be made stronger. That is the fundamental point of the biological tasks of our age. Humankind alone is no longer the focus of thought, but rather life as a whole . . . This striving toward connectedness with the totality of life, with nature itself, a nature into which we are born, this is the deepest meaning and the true essence of National Socialist thought. An emancipatory ecological politics demands an acute awareness and understanding of the legacy of classical eco-fascism and its conceptual continuities with present day environmental discourse. Ecological ideas appealed to the Nazis because they, too, believed that the laws of nature were immutable, and … with their economics of state-managed rather than market capitalism, they approved ecology’s opposition to the laissez-faire market. This is a heady ideological concoction: eco-apocalypticism, global revolution, neo-Marxism, anti-Westernism, cargo cults, the politics of resentment, a global welfare state, economic illiteracy, neo-paganism, Goddess worship, fascism, and a betrayal of the Christian faith. Nevertheless, it appears an exhausted and demoralized Church is trying to re-establish its central position in world affairs by dumping its traditional faith to hook up with the neo-paganism and neo-Marxism of radical environmentalism. 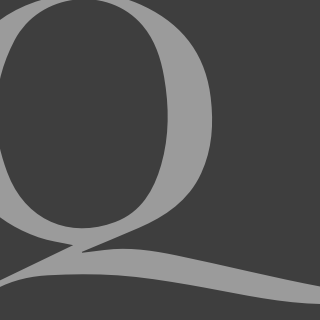 Merv Bendle is a frequent contributor to Quadrant Online. He has a PhD in Comparative religion. Cherry-picking the Pope’s encyclicals. Bet they’ve ignored the gay marriage comments from Der Pabst!! Priceless. and  These quotes are not from Laudato si’. As best as I can ascertain they are taken from the article by Paul B. Farrell that Dr Bendle quotes from at the start of his piece, but I can’t work out where Farrell got them from. This is a quote by the Pope from another paper, not Laudato si’. It comes from Evangelli Gaudium. It is the sort of statement that is scarcely revolutionary coming from a Christian leader (God v mammon, that sort of thing) – trite really. This is not from Laudato si’ either. The Pope has said “It is no longer man who commands, but money, money, cash commands. And God our Father gave us the task of protecting the earth — not for money, but for ourselves: for men and women. We have this task! Nevertheless men and women are sacrificed to the idols of profit and consumption: it is the “culture of waste”. (See https://w2.vatican.va/content/francesco/en/audiences/2013/documents/papa-francesco_20130605_udienza-generale.html). I can’t see where “Greed is the motivation” comes from. The last part of the quote comes from another address (see http://www.zenit.org/en/articles/pope-s-address-to-popular-movements): “An economic system centered on the god of money also needs to plunder nature, to plunder nature to sustain the frenetic rhythm of consumption that is inherent to it.” Again, coming from a Christian leader these are not revolutionary statements. There is nothing wrong with making money but it comes with responsibility, and one should never allow himself to be enslaved to its pursuit, there is more to life than that etc etc. Again, trite. This is the real howler. It is from an article in The Guardian (see http://www.theguardian.com/world/2014/dec/27/pope-francis-edict-climate-change-us-rightwing). It is a journalist’s take on what he thinks the Pope has been meaning to say in other previous statements. It’s not what the Pope has said. There are other fundamental errors in Dr Bendle’s critique, such as the suggestion that the Pope is calling for “a gargantuan transfer of wealth from the tax-paying middle classes of advanced societies” and that “a dictatorial approach be pursued on a global scale, using the notoriously corrupt United Nations as its vehicle or model”. There is no such suggestion. The Pope is a Jesuit hence a Franciscan so he is of course going to go on about the interconnectedness of everything in creation, everything is of value and needs to be cared for such like. He’s not advocating economic or political revolution, just balance and moderation, concern for one’s fellow man and the created world, and communion with God. Frankly there is little if anything in the encyclical, if fairly read for what it actually says, that would offend conservative thinking. Climate change maybe, but he counsels progressive (albeit prompt) transition to renewables: “We know that technology based on the use of highly polluting fossil fuels – especially coal, but also oil and, to a lesser degree, gas – needs to be progressively replaced without delay. Until greater progress is made in developing widely accessible sources of renewable energy, it is legitimate to choose the less harmful alternative or to find short-term solutions”. (And BTW he doesn’t think much of carbon trading schemes and such like). In any case, the potential impacts of climate change are just in the mix of environmental degradation issues that he discusses, like deforestation, contamination of water supplies in poor countries and so on. The Pope is not anti-development, he simply urges care be taken in its conduct. He’s worried about too much inequality but he’s got a point, because human nature being what it is, inequality risks destruction of social cohesion and with that would come the destruction of free markets, wealth and wellbeing. Dr Bendle is entitled to his views on what he thinks the Pope is “really” saying, reading between the lines and such. But it’s not what the Pope has actually said. I understand that Botswana is one of the best-run half dozen countries in Africa, the rest being basket cases. Bit rough to put Botswana at the head of the list of awful Africans. ‘Best run’ is a moveable feast when it comes to Africa. Watch Botswana slide with the rest now that De Beers have moved their money into the country and made it available for ‘processing’ in the African way. As someone who has spent far too long on the African continent, nearly two decades, living in four countries, I can only concur that pouring any more money into the place, whatever the reason, is a delusional waste. Having watched more than one ambassador walk away muttering, they would end aid tomorrow, if they could, which mostly they cannot given the power of the vested NGO agendas, and witnessed first hand the general uselessness of aid which breeds arrogant beggars in mendicant nations and fuels corruption already entrenched in cultures, I am in no doubt that everyone would benefit if the aid tap were turned off. An exception would be emergency aid which is controlled by foreigners and which never finds its way into local hands for distribution. Some $3trillion has been poured into the African continent in the past 50 years and most people are worse off than they were 30 years ago. Those former colonies who were handed economically viable if not vibrant nations along with modern infrastructure and industries have, in the main, managed to trash them within a decade. The trillions of dollars have largely been filtered away by the rich and powerful to bloat their bank accounts and with more than a few of Africa’s ‘leaders’ ranking amongst the richest people in the world, it is not hard to see where most of it goes. Within weeks of being elected, the current President headed to the United States for a month’s stay at the Waldorf Astoria, in the Presidential Suite, costing $17,000 a night with his entourage of 67 staying in various other five-star hotels in New York. No good deed goes unpunished, particularly in Africa, and while this Pope may be refreshing on some issues, he is a do-gooder and that is more dangerous because of the power of his position. 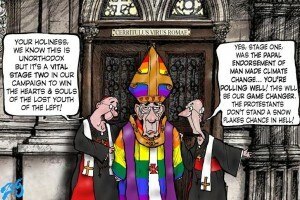 Please excuse the trite cliche, but it is so appropriate in this case “the late John Paul II is turning in his grave”. The evil of Marxist socio-fascism was starkly familiar to him through first hand experience of it. He put a stop to liberation theology, rampant in South America during his pontificate, for that very reaso. — Enemies of the Catholic church have often referred to the Pope as the Antichrist. Francis is hell-bent on proving them right. It’ll probably get worse. The papacy has turned its back on Biblical inerrancy. I know, you couldn’t make this stuff up. 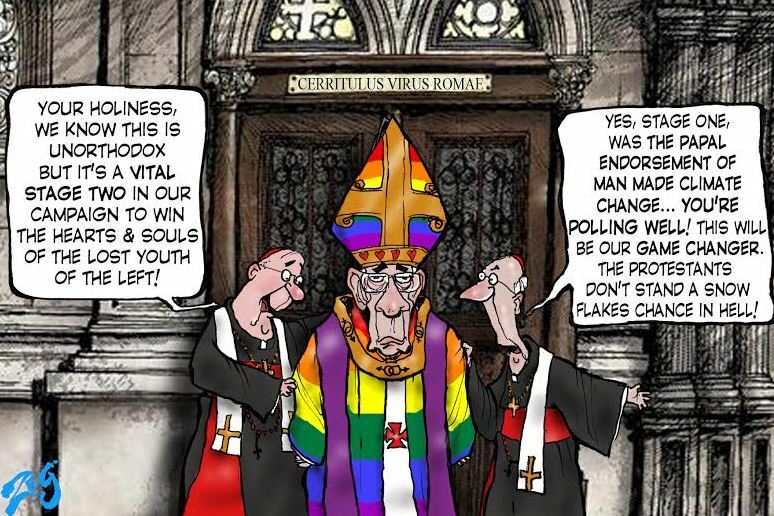 But this means that relativism is now inevitably taking hold in the Vatican. It was the Red Brigade’s Daniel Bendit-Cohen who coined the term “The Long March through the institutions”. I suspect he never thought the march would get this far even in his wildest dreams.